Our original plan was to get some investors and just go for it, but I think approaching it like a grown up 4H project might make more sense. Get a few weaners this year, see if Isabelle will raise them for us, track the costs and see if we can make a decent product before going off to find investors and jumping in the deep end. 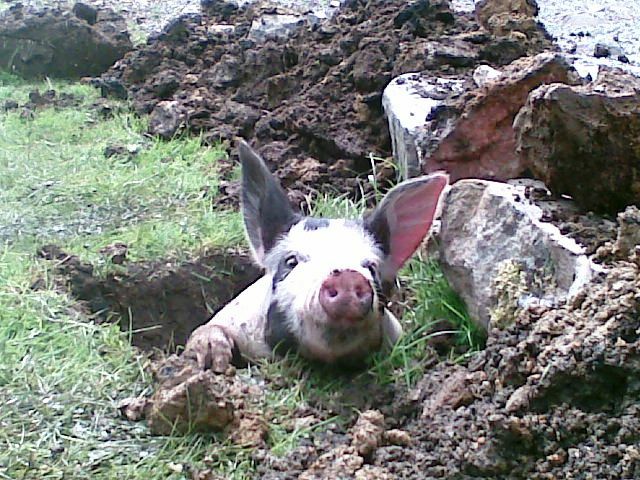 And so, I’ve been surfing sites like the Gloucestershire Old Spots Pig Breeders Club looking at pigs. If we’re going to raise some pigs, why not raise interesting pigs? If we’re not going to raise factory pork, then lets really not raise factory pork. But like I said, we’re still in the dreaming phase. My friend and potential porcine partner is nursing a broken heart, and I firmly believe that nothing helps one through heartbreak like a new project. Pigs for a broken heart anyone? Absolutely a pig for a broken heart! You can tell your troubles to a pig. Ours are at the butcher even as I type and I don’t regret a single moment (though one of our ducklings probably would). Go! Pigs! Don’t forget to have a long enough hose to spray them down. It’s vastly amusing to watch. Pigs are a lot of fun. I enjoy raising them, as well as the end result (both the manure they produce for my garden and the pork). Might I suggest starting with two to four pigs and actually raise them yourself. You’ll learn so much more dealing with them on a daily basis. A good book is “Small Scale Pig Raising” by Dirk van Loon. He doesn’t really cover pastured pigs, which is how we do it, but his book is an excellent resource and the best I’ve seen for getting started with pigs.